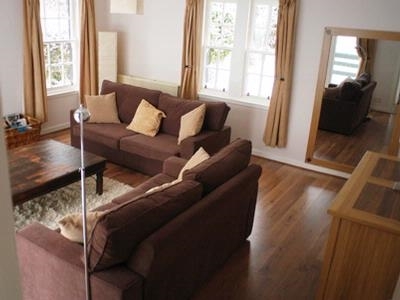 Our holiday cottage sleeps 6 people, with 2 good bedrooms and a bed settee in the lounge. The 100 year old Lodge itself has been recently renovated and is beautifully appointed. It is clean and light – truly a breath of fresh air. It has been tastefully furnished and the kitchen is very well equipped by people who love to cook. Brush up on your board game skills chosing from one of the many available. We have Satellite TV and there is also a comprehensive range of DVDs. There is an iPod docking station, cd player and radio as well as loads of books. Living room: A very comfortable room with 2 setees, one opens up into a large double bed, with views through the French Doors over the Loch. 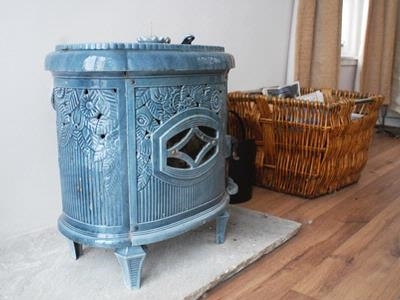 Get cosy and light the antique French woodburning stove. Sit back and just relax. The room has direct access to the deck with the staircase down to the beach. The Kitchen: Everything is there with enough crockery and cutlery to feed an army. There is a dishwasher, microwave/grill, cooker with double gas ovens and hobs, fridge, toaster, kettle and lots of very handy kitchen utensils. The Dining Room: Adjacent to the open plan kitchen is the dining area comprising a beautiful large table that will comfortably sit 8 people. 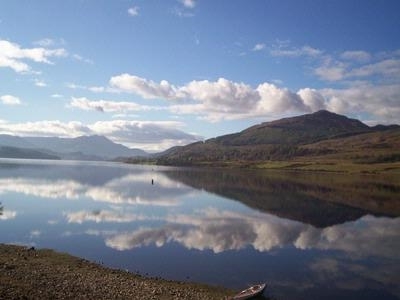 With its wonderful views of the Loch and Ben Ledi it is the perfect place to read your paper with your morning coffee, or relax with a glass of wine. The Bathroom with Shower: The bathroom is brand new and is equipped with a bath, shower, sink, toilet and towel rail. Plenty of room to hang your towels and a shelving unit for all your toiletries. The Master Bedroom: A beautiful room with a king size double bed, large wardrobe and dressing table with mirror. Situated on the forest side of the house, you’re guaranteed a good night’s sleep, (owls permitting). 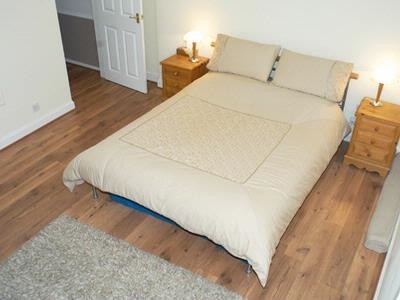 The Second Bedroom:Also situated on the forest side of the house, comprises 2 single beds and a wardrobe. 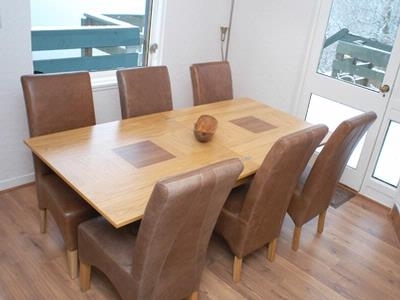 The utitlity room: A great room to come into after a walk on the beach, the forest or after a cycle. Simply throw wet or dirty clothes into the washing machine or stick them into the tumble dryer. The beer fridge is also situated here ideal for storing drinks. 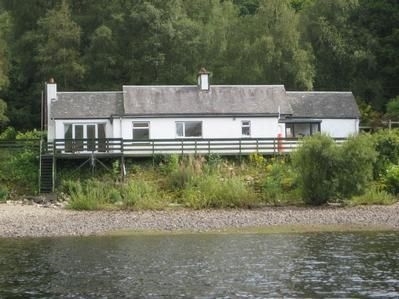 The Deck: The deck allows you to walk along the lochside of the entire house, 3 meters above the beach below, guaranteed great views wherever you look. Have breakfast, lunch and dinner on the deck or picnic on the beach. We can sometimes offer discounts for late availability and short breaks at our holiday cottage. 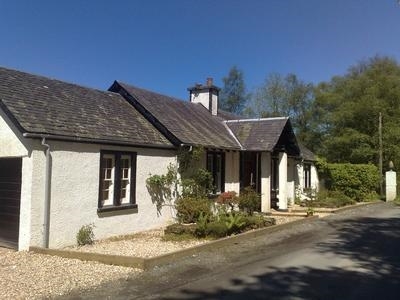 So if you’re planning a last minute break in Scotland and are looking for a great pet friendly cottage then let us know!